The Department of English is requesting $5,000 ($5,500 less a $500 cost share from the UCF Libraries) to purchase Dictionary of American Regional English from the prestigious Harvard University Press. In consultation and collaboration with several academic departments and the UCF Libraries, The Department of History is asking the Technology Fee Committee to approve the purchase of Dictionary of American Regional English. With this one-time purchase, UCF will gain access and perpetual rights to all the content in this dictionary, which is essentially the American supplement to the Oxford English Dictionary (OED). The core lexicographic collection began as a research project in the mid-sixties. During that project, fieldworkers traveled to more than a thousand communities around the country collecting data, including audio data, about uniquely American words. Added to that data are illustrative quotations from regional literature, diaries, small-town newspapers, government documents, related research projects, etc., plus maps illustrating where the different terms are most common. Lexicographers compiled this information into a multi-volume print dictionary, the most exhaustive record of regional speech in America, covering American lexical history from the colonial period to the present day. The entries in DARE include regional pronunciations, variant forms, some etymologies, and regional and social distributions of the words and phrases. The digital version, as would be expected, provides all of this information online, along with advanced search features, interactive maps, and audio files. Additionally, just like the OED, the digital DARE is constantly adding new information to the dictionary. The new information includes new words, new documentary evidence, and even new fieldwork is planned. Dictionary of American Regional English is delivered online and available 24 x 7. The collections will be accessible to all students on campus or off campus through Shibboleth authentication. One hundred percent of UCF students and faculty could have simultaneous access to these outstanding resources. There are no limits to the number of users who can access the content at a given time. The collections are of potential benefit to the entire UCF community, including the current 59,770 students and 1,965 teaching faculty. Because UCF will gain perpetual rights, the collection will meet the study, instructional, and research needs of the UCF community into the future. The content aligns with many UCF course offerings and will support programs in nearly all disciplines. Since the university will gain perpetual rights, the content will meet the study, instructional, and research needs of the UCF community into the future. Given the many subject areas covered within the Dictionary of American Regional English, UCF students and faculty will use the content for research and educational purposes. Faculty in the following programs have affirmed that DARE will benefit their students: History, Anthropology, English, Writing and Rhetoric, Interdisciplinary Studies, English/Language Arts Education, Reading/Literacy (including the Morgridge International Reading Center), TESOL, and Journalism. According to the latest (2012) FTE per UCF Program report, these programs enroll 8989 students. While content from these collections directly impacts these students, it is likely that students in other programs will also find relevant information in the reference. For example, medical students could use DARE to understand the folk medical terms used by patients. Biology students could use DARE to equate local folk names for flora and fauna with corresponding scientific names. Theater students could use DARE’s audiotape collection to perfect their regional accents, etc. UCF students conducting oral history research for the Veteran’s History Project will use DARE to translate unfamiliar terms that their research participants use. American literature classes will use DARE to explain regionalisms found in their readings. Creative writers will use DARE to verify the accuracy of their dialogues. Technical writers will use DARE to enhance their ability to communicate with particular audiences (as a few well-placed regionalisms can go a long way in presentations for the right audience). Anthropology students will use DARE to provide evidence of the socially constructed nature of standard English and regionalisms (as well as variants like African American English). TESOL students will use DARE to appreciate how dialects vary in American English, and how regional variation affects language learning. Journalism students will use DARE to research regional language in local newspapers. Linguistics students will use DARE to investigate historical language change in American English. This is the kind of resource that facilitates everything from classroom assignments (when students encounter unfamiliar terms in their readings or fieldwork), to undergraduate research essays, in both introductory survey courses and senior seminars, to graduate-level theses and dissertations, as well as research for scholarly articles and books. Faculty colleagues in English, Writing and Rhetoric, History, Anthropology, TESOL, and Education have indicated that their students would benefit. It is worth noting that although digital DARE is a new resource that became available for the first time in December 2013, already 27% of the membership Association of Research Libraries (ARL) has subscribed. ARL membership is made up from many of the top research universities. Food and cooking: bear claw, chicken corn soup, flannel cake, frowy, lutefisk, hopping john, kolacky, larruping, piloncillo, red eye gravy, sally lunn, say-so, and many others. Additionally, the same name can refer to different foods in different parts of the country. For example, “cream cheese” in Louisiana can mean “cottage cheese.” A “mango” in the west midland region could be a cucumber pickle. Students in disciplines from Marketing and Hospitality Management might like to know these things. Childhood: Antony-over, buck buck, holler calf-rope, ditch, flying jenny, hosey, king’s ex, pelota, play-pretty, pom-pom-pullaway refer to traditional childhood games and activities, surely of interest to students in Elementary Education and Child Psychology. whang a shirt or xyz your zipper? Students in Theater (costume design) and Women’s Studies might find themselves doing fashion-related research. Politics: Aginner and honeyfuggle are useful concepts for political science students, who might also want to know what Alaskans mean when they refer to the “smaller states.” And journalism students might want to look up, for example, former president Clinton meant when he referred to Adam’s off-ox. to clam a note? Musicians and Music history students will be interested. DARE entries bring o life American cultural practices of bygone days, such as the custom to give a special gift to the first person to utter the words “Christmas gift” to you on Christmas morning, or the custom to Julebukk (travel from house-to-house in costume during the Christmas season), or the desire to receive a lucky first-footer (first person to enter your house after the New Year). And DARE illuminates some surprising regional pronunciation differences as well, such as the fact that the word “lawyer” is pronounced the same as the word “liar” in some parts of the country. These topics are important to many disciplines, not just the disciplines mentioned above. American culture, American language, American history have all shaped our unique lexicon, and every student at UCF can potentially find interesting and useful material in DARE. This collection will therefore complement and extend the library collection in many areas, including areas supported by the technology fee in the past. Students who purchased individual access would have to pay an introductory rate of $150 a year. By purchasing perpetual access to DARE, UCF will make this resource available to all UCF students, now and forever into the future, for only $5,500. Before last December 2013, this resource was available only in print. The six individual volumes are “wrist-sprainers,” heavy to carry, comparatively difficult to look through. The digital format makes all of this material, plus audio files, plus immediate access to new and updated entries, available to UCF students from anywhere on campus or off, through the Internet. The depth and breadth of the collection offers flexibility and creativity to instructor and student. Materials can easily be incorporated into face-to-face, mixed-mode, and online courses. Furthermore, because the search features in the product make it easy to discover relevant content, a student or researcher can spend more time on analysis. High quality metadata and subject terms will also enhance the search capabilities. The ability to share DARE material through social media allows students to communicate with friends and family about their studies more easily. The UCF Libraries will promote the awareness and use of Dictionary of American Regional English through a variety of channels. The Library will actively collaborate with Dr. Melody Bowden at the Faculty Center for Teaching and Learning to publicize the collections. The focus will be on educating faculty about the importance of these resources and how they can be used for course assignments. The Libraries will distribute informational brochures during various events, such as the faculty development conferences, and will feature information about the collections in newsletters, library blogs, exhibits and special events such as Cram for Exam. Librarians will educate students on the quality, breadth and depth of these collections during Information Literacy sessions. 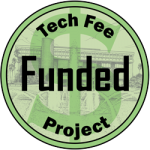 The requested funds ($5,000), in combination with the $500 cost share from UCF Libraries, will cover the one-time cost of Dictionary of American Regional English. DARE will be hosted by Harvard University Press, so there will be no new demands on UCF staff or infrastructure. Content in DARE will be occasionally updated and a small annual update fee will be paid by the UCF Libraries to ensure that UCF students will have access to the most current version.